Our activities in North Korea began in 2012 at the request of the Korean Federation for the Protection of the Disabled (KFPD). Our goal is to strengthen the organisational capacity of partners, ensure strong and sustainable services for people with disabilities and support children to grow with better standards of living. We hope that our work will extend to Nepal and Cambodia. We are currently supporting schools for disabled children in North Korea through the KFPD. Already, these children have benefitted in their learning and wellbeing through our provision of: Books, Braille printers, Braille laptops Other educational supplies nutrition programmes and rehab for children so on. We also support the sports teams for the disabled in North Korea. There is still a long way to go, with much work to be done and we hope to achieve in the future. 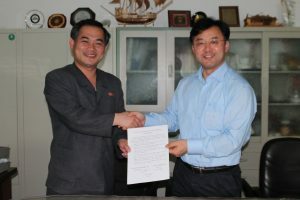 Originally known as the Korean Association for Supporting Disabled (July, 1998), the Korean Federation for the Protection of the Disabled [KFPD] acquired federation status in July, 2005. It is the only non-governmental organisation recognised by the North Korean government to represent all the institutions related to the disabled people.